Arrive in Broome and get transferred to your central Broome Hotel. Airport Transfer, Overnight Broome Accommodation. The bustling and cosmopolitan town of Broome is located in Western Australia's vast and beautiful Kimberley region, Broome has a fascinating pearling heritage and history and displays this in attractions such as Pearl Luggers and the emotive Japanese Cemetery, other attractions include The Wharf, Chinatown, Cable Beach and Sun Pictures. Discover Broome on your half day coach tour around the township. Visit Chinatown, the Cygnet Bay Pearl Farm and Matso’s Brewery. Spend time at the Japanese Cemetery and examine dinosaur footprints at Gantheaume Point. 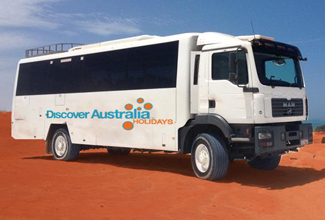 Luxury Coach Tour with Hotel Pick Up, Overnight Broome Accommodation. Spend a day exploring Broome at your own leisure before making your way to the beach for your sunset camel ride along the wide expanse of Cable Beach and its shimmering white sands. An unforgettable experience, as you snake along the shoreline the view from atop your friendly camel is breathtaking, the turquoise waters dissolve the white sands as sensational molten gold sunsets set over the glorious Indian Ocean. Cable Beach Camel Ride, Overnight Broome Accommodation. The Gibb River Road offers a real taste of outback adventure, the road travels some 700 km from King Sound at Derby to the Cambridge Gulf at Wyndham, the Gibb River Road takes intrepid adventurers past towering gorges, cascading waterfalls and gushing rivers, spot for freshwater crocodiles, swim in glistening rock pools and canoe down picturesque rivers. Get picked up from your Broome hotel for your 5 day luxury 4WD tour. Depart Broome and visit the Boab Prison Tree in Derby on your way to Fitzroy Crossing. Visit Windjana Gorge and wade through the cool waters of Tunnel Creek before arriving at Fitzroy Crossing for the night. Overnight Luxury 4WD tour, Lunch, Dinner, Overnight Fitzroy Crossing Accommodation. The outback town of Fitzroy Crossing lies on the banks of the Fitzroy River some 391 km east of Broome in Western Australia, this small town is the ideal hub from which to explore the beautiful Kimberley region and the nearby attractions of Geikie Gorge, Windjana Gorge and Tunnel Creek, still standing in the old town are original buildings such as the former post office and police station. Leave Fitzroy Crossing and head towards the spectacular Bungle Bungles, your home for the next three nights. Breakfast, Lunch, Dinner, Overnight Bungle Bungles Accommodation. The Bungle Bungles are one of Australia's most iconic natural attractions, these black and orange striped, domed rocks rise dramatically from the floor of the Piccaninny Gorge in northeastern Western Australia, the day's changing light illuminates the rocks in various different hues giving them an almost mystical and magical appearance. Take a captivating hike to Echidna Chasm, a spectacular natural cleft in the rock. Join a hike along a Liviston; this palm-fringed trail will guide you to see the spectacular natural wonder of Mini Palms. Walk along the rocky, dry creek beds for an unforgettable view into a subterranean oasis where hundreds of ancient palm species are surrounded by towering cliffs. Breakfast, Lunch Dinner, Overnight Bungle Bungles Accommodation. Today, explore the Bungle Bungle Range and take a walk along Picaninny Creek, a gorge within the Bungle Bungle domes. Marvel at the natural amphitheatre of Cathedral Gorge before enjoying sunset drinks as the suns sets on the Bungle Bungles. Breakfast, Lunch, Sunset Drinks, Dinner, Overnight Bungle Bungles Accommodation. The Bungle Bungles are located in Purnululu National Park in northeastern Western Australia, the Bungle Bungles are an incredible sight, giant orange and black striped dome shaped rock formations that rise dramatically from the floor of Piccaninny Gorge, the day's changing light illuminates the domes in ever changing hues giving them a mystical and magical appearance. Today, hike up to Echidna Chasm and discover its striking colour variations, depending on the angle of the Sun or maybe take a scenic helicopter flight over the massif (own expense). Later, travel along the Great Northern highway to your accommodation for the night at Halls Creek. Breakfast, Lunch, Dinner, Overnight Halls Creek Accommodation. Geikie Gorge National Park is one of the Kimberley's most accessible national parks, situated only 20 km from the town of Fitzroy Crossing the park is home to picturesque, rugged gorges that are littered with a maze of walking and hiking trails, one of the best ways to see the gorges in all their splendour is to take a boat or cruise tour. Depart Halls Creek and stop at Geikie Gorge on your way back to Broome. Marvel at the bleached Gorge walls on a cruise along the Fitzroy River before arriving in Broome. Breakfast, Geikie Gorge Cruise, Lunch, Overnight Broome Accommodation. Get transferred from your Broome hotel to the airport for your flight home. 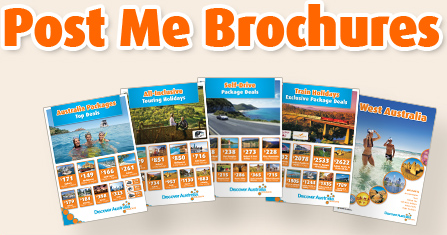 You have 3 choices of accommodation in Broome. Our "Good Standard" central Broome hotels have great facilities, a comfortable room and friendly service (typically 3.5 stars). Alternatively, why not treat yourself? The "Deluxe" hotels have superior facilities, stylish rooms and first class service (typically 4 stars). The “Luxury” hotels are upscale with a more luxurious feel for the discerning traveller and great for celebrating an anniversary (typically 5 stars). You will be transferred from the airport on arrival in Broome to your Broome hotel. You will also be transferred from your hotel to Broome airport for your flight home. The Bungles & Kimberley Gorges Luxury 4WD Touring is very popular. Many dates book out well in advance, please book soon.